Collagen is a natural protein connective tissue within our skin, occurring most often with elastin. 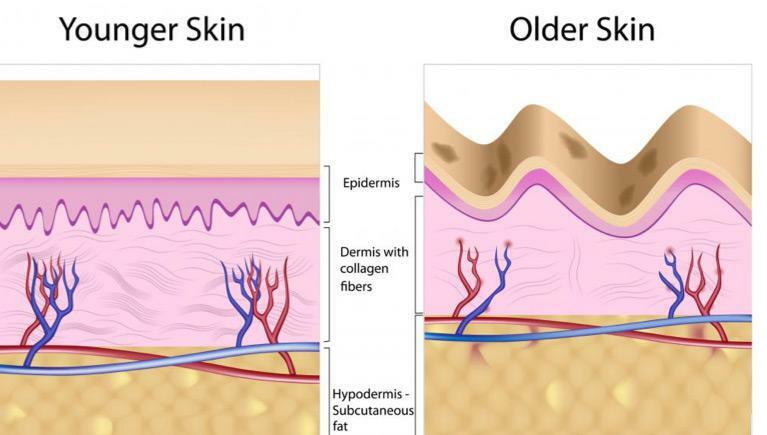 In youth, collagen is abundant and provides a smooth appearance, but as we age this building-block of skin deteriorates. With the loss of collagen in our epidermal structure, the skin begins to sag, creating depressions and other undesirable facial features. One of the more noticeably depleted features are the lips, which lose their curvy shape and lay flat against the skin. Over time the lips deflate, and lines and wrinkles envelop the mouth. Replenishing with collagen can restore youth and beauty to the face by plumping up these diminished areas. During consultation, the options for dermal filler enhancement of lips or facial wrinkles will be reviewed with you. Each of these materials are discussed at length. Most often, thinner fillers are selected for lips to keep them soft such as Restylane Silk. Juvederm is often frequently used. Dermal filler injections are performed on an outpatient basis and do not require sedation or anesthesia. Dr. Gentile however may numb the pre-treated areas with a topical anesthetic or cooling gel pack. After prepping for the dermal filler treatment, Dr. Gentile will administer facial injections to the areas discussed at your consultation. The appointment will last 30-60 minutes and the results are immediate. Although some minor post-procedural swelling and bruising may occur, there’s minimal recovery or downtime. Basically, you step into your doctor’s office for treatment and step right back into your life! Sometimes, dermal filler injections are part of a larger cosmetic restoration process, and are performed in conjunction with a facial plastic surgery or skin repairing procedure. The brow lift, mid-facelift, lower facelift, traditional facelift, laser skin resurfacing and microneedling treatments may also involve collagen injections. In these instances, you will generally be placed under anesthesia for the more extensive facial cosmetic treatment. Cosmetic dermal fillers are composed of hyaluronic acid, a naturally occurring substance in your skin that helps add volume and hydration. Injectable hyaluronic acid also attracts and binds water, helping maintain fullness in the areas of injection. Dermal fillers may be used in an array of treatments ideal for correcting the signs of aging or adding natural contours to the face. Benefits may last six months or longer. Restylane is a hyaluronic acid gel produced by bacteria used for treating facial wrinkles and folds. It is a non-animal stabilized hyaluronic acid (NASHA), so-named because it is not derived from animal sources. When injected into wrinkled skin, Restylane adds fullness and reduces wrinkles in the injected area. Juvederm is a smooth-consistency hyaluronic acid gel. The physician eases this injectable gel under the skin to instantly restore volume and smooth away wrinkles and folds. Juvederm eases facial creases like the nasolabial fold “parentheses” running from the bottom of your nose to the corners of your mouth. Radiesse uses a calcium-based microsphere technology to deliver soft and natural-looking results. It also stimulates the body to produce new collagen, and continue that more youthful and attractive look over time. Radiesse helps correct oral commissures, “marionette” facial lines extending down from either side of the mouth. These can create a serious or sad expression, even when your face is at rest. For many patients, the benefits of treatment with Radiesse can last a year or more. Sculptra is a synthetic biocompatible lactic acid material (similar to that produced by exercising muscles), used to improve the appearance of aging skin folds, indented chin surfaces, hollowed cheeks and sunken eyes. Sculptra works to gradually produce increasing thickness of the skin, and can provide up to 80% improvement in treated areas. Sculptra results are fully evident in in two to three treatment sessions and last up to two years. If dermal filler injections are performed by a trained facial plastic surgeon, the lips will no longer appear aged and wrinkled but fuller, more curvaceously appealing without looking fake or overdone. When evenly-spaced injections of the correct amounts of dermal filler are used, the result is an even fullness of the lips. Forehead lines, crow’s feet, wrinkles around the lips and mouth, even indentations from scars-all can be dramatically improved or eliminated. Nasal labial folds and under eye depressions and bulges can all be improved with cannula based filler injections. Although complications rarely occur as the result of dermal filler injections, there is a slight possibility of unwanted side effects including reactions to the filler; infection; and uneven skin tone or texture. These risks increase greatly when an untrained individual attempts treatment.